Tupac was an American rapper who was murdered in 1996. 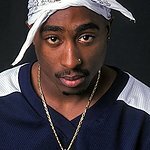 Tupac Amaru Shakur dealt with great obstacles such as homelessness, hunger, and pain, amongst other situations during his youth. Performing arts provided the hope that would seed the expression that would one day influence generations worldwide. Tupac accomplished a lot before his murder at the age of 25. At an early age, he wrote and organized family productions, casting himself as the lead and his older cousins in supporting roles. Tupac formally trained at the 127th Street Ensemble and Baltimore School for the Arts. At the age of twelve, he experienced his first formal stage role as the character “Travis” in the stage play ‘Raisin In the Sun’ at the prestigious Apollo Theatre in Harlem. Tupac was eventually cast in several feature films and recorded several chart topping albums. In fact, he released the first ever double hip-hop CD. Today, years after his physical departure, he is the second highest selling Hip-Hop artist of all time. His gift- his words and creative talent- continues to inspire others around the world! His mother, Afeni Shakur, established the Tupac Amaru Shakur Foundation in 1997. Tupac Shakur has passed away, but we remember his charity work. Google trends for "Tupac Shakur"
We don't have any videos related to Tupac Shakur.